Notes on Gabriel also indicate a wife of same name for one of his brothers. Very likely something has been confused. I'll send you a copy of what Dorice Young sent to me. It says that Marcus was working at the Yellow Jacket Mine on the Salmon River, helping to add another sluice box to those in place. The bank caved in and he was thrown into the river. His body was never found. He was 68 at the time of his death. Judging from the different ages given for him on each census, I wonder if he knew what his age was. So, adding 68 to the various years he might have been born, the accident might have happened in 1904, 1905 or 1907. The California State Death Index starts in 1905. The first book covers 1905 to 1929. He was not in it. I do not know where Dorice Young found the information about Marcus. I believe she copied it from somewhere, rather than typing what she had heard from someone. Mr. Marcus F. Bradley (Frank's father) was a farmer for many years. 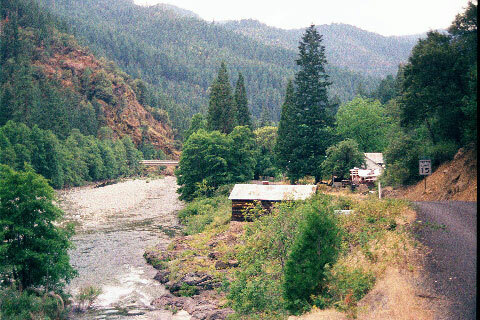 While working at the Yellow Jacket Mine on the Salmon River, helping to add another sluice box to those in place, the bank caved in and he was thrown into the river. His body was never found. He was 68 at the time of his death. He married Sarah Luttrell who was born in Knoxville, Tenn. Her family moved to Fort Jones. Mr. and Mrs. Bradley had six children, Alfred, Frank, Allen, Nettie Oltman, Orphie Brady, and Annie Single. In 1888 Caroline Young married Frank Bradley and for several years lived in Callahan. Then Frank who was a barber by trade, bought the barber shop in Etna. When the shop burned in the town fire of 1896, Frank built a brick building. After operating his shop for over fifty years he sold it to his son-in-law, Lester Calloway. After the death of Mrs. Young, the Bradley family moved from their home to the residential part of the old meat market building where Caroline's parents lived. Mrs. Bradley died in 1938 at the age of 69 and Frank died in Redding in 1958 at the age of 92. At last I have gotten information about the Young and Bradley families. This material was in the Historical Society book on Etna. No one seemed to know about Marcus Bradley but after doing a bit of inquiring I got some data. I can remember Sarah Bradley. The pictures of Grandmother and Grandfather Young are the only ones I have but thought you might like copies. I couldn't find a picture of Caroline. You may keep the picture of Sarah Bradley and Albert (Loren's father) and also the History of Scott Valley which I thought you may enjoy reading. I am no typist so overlook all mistakes. The visit with you and your family was ever so nice and enjoyed the delicious dinner with your lovely family. We went to Medford Friday to a Pre-Holiday Bazaar. Forty organizations had booths in the Armory. We are having Thanksgiving dinner with Barbara. Agnes is getting along just fine. She gets around in her walker. This is the town supposedly near which Marcus was drowned. It was late in the day. I am surprised the picture came out at all.